Former Bolton Wanderers owner Eddie Davies gave the club a £5m loan to help them avoid administration four days before his death, it has emerged. Documents filed at Companies House show Davies signed off the loan on 7 September, four days before he died. The money was used to pay off Bolton's main creditor BluMarble Capital Ltd, who rejected a first repayment offer. It meant the Championship side avoided a 12-point deduction and a transfer ban from the English Football League. When contacted by BBC Sport, the club said it would be making no comment "at this moment in time". 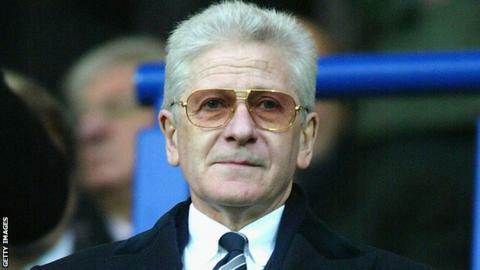 Davies, who was 72, helped bankroll the Trotters' emergence in the Premier League during the 2000s after first joining the club's board of directors in 1999. He stepped down as chairman when the club was bought by Sports Shield and chairman Ken Anderson's Inner Circle Investments in 2016, with Davies writing off in the region of £175m worth of loans to allow the takeover to progress. Anderson acquired Sports Shield's shares in the club after it went into liquidation in August 2017.